I am a huge fan of muted colours and natural textures when it comes to play area storage. It’s not as if something that is filled with toys is ever going to look drab. 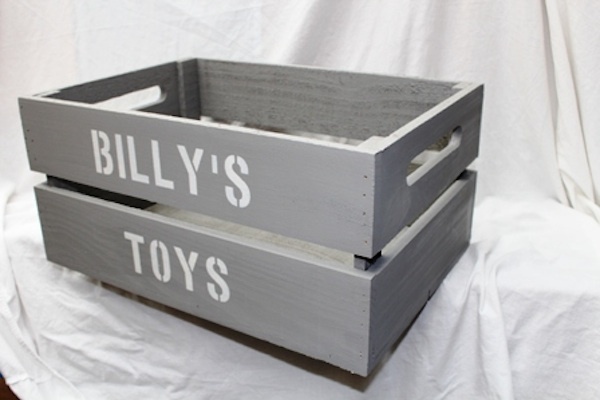 This is why I am really loving these personalised toy boxes. 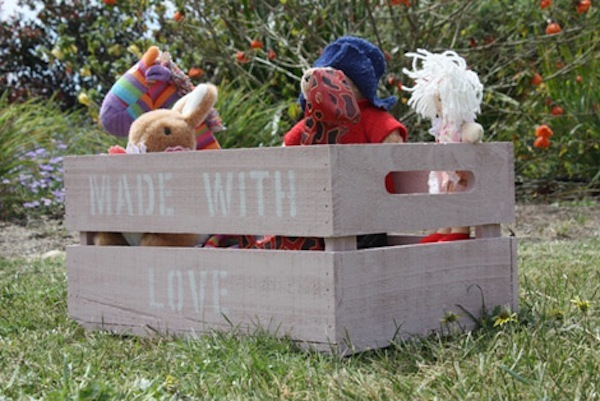 The Bushel Box Co was founded by mum-preneur Claire Davey and specialises in customised wooden crates perfect for little bedrooms and playrooms. Boxes come in four sizes – Apple Crate ($59.95), Apple Tray ($49.99) , Apricot Crate ($54.95) and Bushel Box ($59.95) To make your box exactly what you want, when you order, you can choose any name or phrase that takes your fancy. Personally, I’m going with ‘for God’s sake, put the toys away!’. There are nine subtle colour choices for both the box and the writing, from creams and greys to muted pink and red. Delivery charges vary, depending on where you live in Australia. These make a great alternative base for a baby gift basket, complete with the little one’s name on it. Hint, hint.